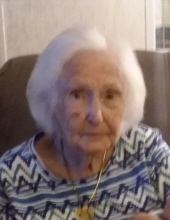 Mary Stephens Ayers, 91, passed away Monday, March 25, 2019. A graveside service will be held at 1:00 P.M. Thursday, March 28, at Southland Memorial Gardens. Visitation will be held from 11:00 – 12:00 P.M. Thursday, March, 28, before the service at Milton Shealy Funeral Home. Service will be conducted by Pastor Ross Smith, II also assisted by Chaplain David Coffman. Mrs. Ayers was born in Montgomery, AL, daughter of the late Hezekiah and Beatrice Wilson Stephens. She was married to the late Archie C. Ayers, Sr. She was preceded in death by her first husband, Porter L. Kelly. Surviving are her son, Ronald Dean Kelly; grandchildren, Celeste Kelly, Mariann Kelly, Patricia Kelly, Billy Kelly, Stephen Kelly, Andrea Lee, Jennifer Smith, David Kelly, Alisa Stokes, Stacey Johnson, Shawna Woodley, Kelly Williamson; numerous great and great great grandchildren; daughter-in-law, Carol Kelly; many nieces and nephews; and a dear friend, Brenda Augustin. She was preceded in death by her sons, Ralph, Alex Wayne, Larry R. and Donnie Ray Kelly; brother, Rudolph Stephens; sister, Faye Prittchet; and grandchild, Alex Kelly. To send flowers or a remembrance gift to the family of Mary Stephens Ayers, please visit our Tribute Store. "Email Address" would like to share the life celebration of Mary Stephens Ayers. Click on the "link" to go to share a favorite memory or leave a condolence message for the family.